The following is the text of a talk delivered by Rabbi Yisroel Dovid Weiss at the United Association for Studies and Research Studies (UASR), publishers of the Middle East Affairs Journal. The lecture was part of a round table discussion, held on March 14 2002 and hosted by MEAJ editor-in-chief, Dr. Ahmed Yousef. My task today is to speak about Judaism and Zionism. Given the current assumptions of the mass media that seems to be a redundant title. Aren’t the two one and the same? Isn’t Judaism Zionism? Aren’t Jews by definition Zionists? This is an impression which is, as I hope will become absolutely clear by the end of this talk, totally false. It is, however, an impression that is today quite widespread, both among non – Jews as well as misinformed Jews. significant easing of its people’s suffering. propagandists and international apologists, in the ideological driver’s seat. incessantly exploited by the Zionist propaganda machine since 1945.
immense resources that the Zionist lobby invested in destroying the careers of politicians all across the United States who had voiced some qualms about this nation’s subservience to Israel. Yet, outside of a limited circle of anti - Zionist Jews, this cowardly and cold blooded murder is completely unknown. S. S. Struma in 1941 which cost the lives of 276 innocent Jews in the case of the former and 769 in the case of the latter. More is known about pre - state terror campaigns against Arab and British innocents. Clearly, this was a movement that found human life cheap and public criticism intolerable. Fortunately, though, Zionism is missing the most potent weapon in any ideology’s arsenal. It doesn’t have the truth on its side. Thus, we find that, today, despite the power of the Zionist lobby and the subservience, until recently, of most politicians, media outlets and educational settings here in America, to its dictates, the historical blackout is coming to an end. More and more people are questioning the Zionist version of history. At the United Nations and throughout Europe the questions have already been raised and largely answered. 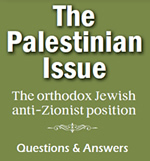 The answers are a variety of criticisms of the Israeli state. Some of these center on Israel’s practices. Others point to its underlying philosophy. Neturei Karta International has always been in the forefront of those voices that have been raised in opposition to Zionism. Our opposition has taken us around the world, to Yemen and Iran, to South Africa and Geneva to attend this past year’s UN Conference on Racism (and I believe we have copies available of the talks delivered there). Our supporters have stood up to Zionist censorship and terror in the streets of Jerusalem, Manhattan, London, Manchester, Montreal and wherever Orthodox Jewish communities may be found. But, we are getting ahead of ourselves. In order to understand the sources of the current pain in the Middle East, we must define our terms. What is Judaism and what is Zionism? centuries Jewish scholars and saints have explained the Law. Those explanations are also part of our tradition. This definition of Judaism was universally accepted by the Jewish people until the dawn of the so called Enlightenment in Europe. In the wake of that mass abandonment of G-d, many Jews, as well as many Christians and Muslims around the world, came to reject their faiths. One of the central tenets of Torah is that the Creator rewards and punishes mankind. Through many of the Prophetic books in the Old Testament the Jewish people were warned that a serious rebellion against the Will of G-d would result in the most severe of punishments. Unchecked it could lead to the ruin of the Holy Temple in Jerusalem and the exile of the entirety of the Jewish nation. And, it is here, my friends, in those Old Testament prophesies, that the quarrel between Judaism and Zionism begins. always, held to a very demanding Divine standard. But the prophecies of doom were accompanied with promises of consolation. The exile would not be forever. There would be years of dispersion, many of them endured under persecution. Yet, there was the promise that the people would yet return to the Land. But this return was not to be under human control. It would be heralded by the advent of Elijah the Prophet and accompanied with many miracles. And, this time, the redemption would not just be for the Jewish people but, rather for all men. All nations would cease to practice war. All would rejoice together in the Creator’s care. permissible path to end the exile were repentance and prayer. To suggest that one could use political or military means to escape the Creator’s decree was seen as heresy, as a denial of the Divine stewardship over sin and forgiveness. And, so, as the centuries rolled by the Jewish people prayed and awaited the miraculous events of redemption. Throughout these long years no Jew anywhere suggested – and this among a people that studied its sacred texts constantly and wrote about them voluminously – that exile could be ended by human means. The Holy Land was always venerated, of course, and small colonies, almost uniformly devoted to prayer, contemplation and study were established there. It was only towards the end of the nineteenth century, among Jews far estranged from their faith that the notion began to be put forth that exile was the result of Jewish weakness. Theodore Herzl and a handful of others, all ignorant or non observant of Torah began to set the process in motion that by the end of the next century would have produced untold suffering for Jews and Palestinians. These early Zionists were immediately opposed by the Rabbinic Leadership of that era. The opposition was based on four assumptions. 1) The very concept of Zionism was a refutation of the traditional Torah belief in exile as punishment and redemption and as dependant on penitence and Divine intervention. reject Judaism be Jewish leaders? Their natural instincts were to uproot Torah and its observance. the Palestinian people already living in the land. Its heavy - handed policies were sure to cause much pain and suffering and lead world Jewry into needless conflict with the nations of the world. 4) Zionism would cause Jews to be less than loyal to the governments under whose auspices they lived in exile. This might weaken Jewish patriotism and exacerbate Jewish – Gentile conflicts. Throughout the world Zionists were a minority. Even those Jews who had lost touch with Torah tradition were able to see that Zionism was a recipe for disaster. These were the words of a non – believer but of essential decency. His ideas and those of his small band of followers were cast aside by the Zionist mainstream. Of course, in the Torah view the very notion of Jewish sovereignty of any kind over the Holy Land is forbidden. We note that even those who desired some degree of Jewish return – saw this – provided they had some basic decency, as something that had to be worked out with the approval of the native Palestinian people. shooting conquest with acts of terror against Palestinians, British and other Jews becoming the order of the day. But, despite Zionist machinations, if not for the tragic fate of the Jews in the Second World War the state of Israel probably would never have come into existence. As stated before, after the Holocaust, the world took its sense of pity for the Jewish people and bestowed it on the Zionists. Little if any thought was given to the deep and just desire of Palestinians to be a sovereign people in their own land or to the anti – Zionist Jews living therein. It was as if a man having been chased from his home by a mob comes upon someone else’s else home and decides to chase out its inhabitants and take it over. Surely the suffering the man has endured at the hands of the mob is not enough for another family to be evicted from their centuries old place of residence. agreed. But they could not be expected to abandon, their homes and property and their very identity to make way for hundreds of thousands of Jewish refugees whose goal was to dispossess them and rule over them. Throughout the twentieth century a large segment of Orthodox Jews has remained immune to Zionist temptation. Unfortunately, during this same period, some orthodox Jews actually embraced Zionism while others attempted to co – exist with it. Those who have maintained our faith as it was handed down to us over the centuries have fought Zionism in the Holy Land and throughout the world. These Jews, many of whose descendants live in Jerusalem to this day, have refused to recognize the Zionist state. They do not vote in its elections or serve in its army. They do not accept any financial support from the government for their schools, thus plunging their schools into a never ending fund raising crisis. leaders it desecrates G-d’s Great and Holy Name in public, a very grave sin in the eyes of the Torah. Yet, we must break through if there is to be any real peace in the Middle East. We have been informed by our Talmudic sages that any premature attempt to end exile will result in massive bloodshed. The bloodshed is here. Israel has caused more bloodshed than anyone could have possibly imagined. Decades before the state the Zionist desire to rule over the land led to riots, assassinations and endless death and suffering. To this day the death toll mounts. Both hardliners and soft liners have had their hopes dashed. They have both been behind the wheels of government. And both have failed utterly. Friends, there will be no peace in the Middle East until their is no state of Israel. The Torah cannot be violated. Our task in exile cannot be fulfilled by trying to end exile by human agitations. Nor can our hopes for redemption be realized in the Israeli state. Of course immediately part of the solution is, we’d like to see the West Bank and Gaza settlements dismantled. The people living there must leave as soon as is humanly possible. But, this is only one part of the solution. Yes, the immediate decision in keeping with common sense, is to begin a Palestinian state. But these solutions are only for the interim and only a part of the solution. The true Torah solution, the key to peace is the immediate return of Palestine to the Palestinians in its entirety including the Temple Mount and Jerusalem. This would, of course, include a full right of return for all Palestinian refuges That is what elementary justice demands. This is the path of the Torah and of common sense. Of course, today, millions of Jews reside in Palestine. Whether some, all or none of them might stay under Palestinian rule is, of course, up to the land’s rightful rulers, the Palestinians. This will inevitably begin the process of true peace with justice and healing between the Palestinian people and the Jewish people. In the meantime, though, given that at present many Jews living in the Holy Land are victims of Zionist propaganda what path should be pursued? For our part the obligation remains steady. It is to educate the Jewish community about the doctrinal errors and practical evils of Zionism. It is to join our Palestinian cousins in protest against the evils of Zionism. It is to pursue peace with all men and all nations. It is to practice our faith. It is to worship the Creator with humility, with modesty and piety. But let us go a step further and examine what the impact of Jewish anti Zionism might be on the Islamic world. First, it is important both practically and morally that Palestinian and general Islamic ideology not confuse Zionism and Judaism and by so doing leave themselves vulnerable to the charge of anti - Semitism. stereotype of them in the Zionist dominated media as bigots and baseless haters. This coalition of anti - Zionist Jews and Palestinians who see the inhumanity of Zionism might well become quite a moral force for good in the world. The hour is late. The civilian death toll mounts daily. Innocents on all sides suffer. May it be the Creator’s Will that the state of Israel be peacefully dismantled speedily in our days, that Jew and Palestinian live yet in peace with each other around the world and in the Holy Land and that speedily in our days all mankind may merit the advent of Divine Redemption where G-d’s Kingdom will be accepted.